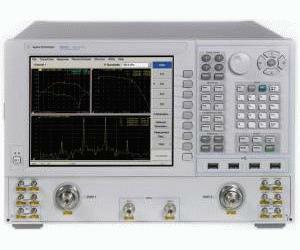 The Agilent N5242A premier-performance network analyzer is a member of the PNA Series network analyzer platform and provides highly integrated measurement capabilities for active device tests. It is an integrated vector network analyzer featuring a built-in S-parameter test set, one or two synthesized sources used for device stimulus, a hard disk drive, USB interfaces and a 10.4 inch LCD touch screen display. The standard 2-port test set comes with six front-panel access loops. The loops provide access to the signal path between (a) the source output and the reference receiver, (b) the source output and directional coupler thru arm and (c) the coupled arm of the directional coupler and the port receiver. The standard test set also includes a solid-state internal RF transfer switch in the R1 reference-receiver path.